Our Desert Southwest Conference summer camps are amazing experiences for spiritual growth and leadership development for children, youth, and adults! There are a great variety of summer camp options at Mingus Mountain Methodist Camp and Retreat Center (outside of Prescott, AZ) and Potosi Pines Methodist Camp (outside of Las Vegas, NV). You can get more information, or register now, by visiting their site at www.dsccamps.org. Younger Elementary Camps, for children in Kindergarten through 3rd grade, are offered at each camp site. At Potosi, campers get their first taste of what overnight camp without mom and dad will be like; at Mingus, parent(s) stay the nights with their child(ren), experiencing camp side-by-side with their little campers. Sr High Leadership Camp is a new experience at Mingus Mountain this coming summer. A small camp of 14 youth will work with adults to learn and grow as leaders, integrating service with other children with lessons on leadership from the Disney Leadership Institute. Adventure Camps, for both Middle and High School Youth, are back this summer at Potosi Pines. Over the course of these weeks, campers engage in hiking, cooking outdoors, and more! Horse Camp (at Mingus) returns for its second year! Elementary and Middle School aged youth, entering grades 5 through 8, are invited to join us for a week of camp that includes introductions to horsemanship including horse care and riding. Be sure to register early, as space may be limited. You can register online (www.dsccamps.org ) or contact Dina Reid, our Camp Registrar, at dreid@dscumc.org or 602-266-6956, ext. 215. Camp and Retreat Ministries are a vital place for the discipleship growth and leadership development of children, youth, and adults. You are invited to contact us for a copy of our 2016 Annual Report, which shares more about how Camp and Retreat Ministries in general, and our volunteer driven model specifically, helps to develop faith and leadership. Established in the late 1940's, Mingus Mountain Camp & Retreat Center has nurtured and nourished generations of campers and families under its towering Ponderosa pines and night skies splashed with countless stars. 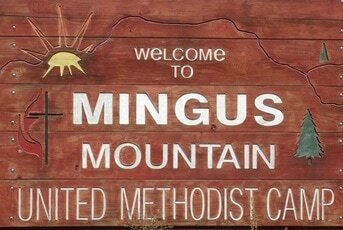 Mingus Camp hosts a great variety of camping ministries for The Desert Southwest Conference of the United Methodist Church throughout the year, and is also available for church retreats, small group meetings, corporate meetings, and more. Also, feel free to give us a call at 480.948.0529 or stop by and visit us at 11735 North Scottsdale Road, Scottsdale, AZ 85254, anytime! We'd love to hear from you!